I haven’t set out to list everybody in London who might support my campaign. Instead, I’ve asked a few people I’ve worked with over the years to tell you why they think I’d be a good London Assembly Member and Mayoral candidate. Having worked with Tom for many years, I’ve seen his excellent relationships with campaign and community groups, his strong grasp of London’s housing and environmental crises and his ability to build cross-party coalitions. He would be an extremely effective Assembly Member and a forceful advocate for the Green agenda. I urge you to put Tom as your number one choice on the ballot paper. Working at City Hall for the past six years, Tom has a real grasp of the issues facing London: from the housing crisis to air pollution, from cycle deaths to poverty pay. He’s also got an impressive track record in local campaigning which would prove invaluable as a Green Assembly Member. I urge you to select Tom for a winnable place on the Londonwide Assembly list. Tom’s campaign work in Crystal Palace overlaps the Croydon North constituency, a parliamentary seat I have stood as Green party candidate on four occasions. The area has a strong sense of community, where if you do good work – people know about it. When introducing myself, I have lost count the amount of times when canvassing, running a stall or just attending meetings when a Crystal Palace resident area mentions that Green guy, or Tom by name. 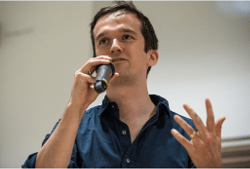 Tom has been a dedicated and dynamic voice for the Green Party in his role as spokesperson for housing, and has built up fantastic links in communities around London. He is very skilled at communicating and defending Green Party policies, and would be a credit to the party in the London Assembly and as mayoral candidate. Tom’s work at City Hall was absolutely integral in making London’s first Community Land Trust happen. He is a dedicated, hard working and insightful advocate for affordable housing across the capital and would be a powerful voice for change inside the London Assembly. Working with Tom as a London officer and in his capacity as our national Housing Spokesperson, I have been impressed by his drive and his ability to spot media opportunities for the party. Tom’s desire to work strategically, listening to and working with members across the region, is something I think will make him an asset on the Assembly. Tom is a great advocate for the party, and I was genuinely honoured to be able to vote for a Tom as my local candidate in the 2015 General Election. By placing Tom as one of my top choices for the Greens’ Assembly list I hope to be able to vote for him again this coming May – and this time to see him elected. I hope you will do the same.